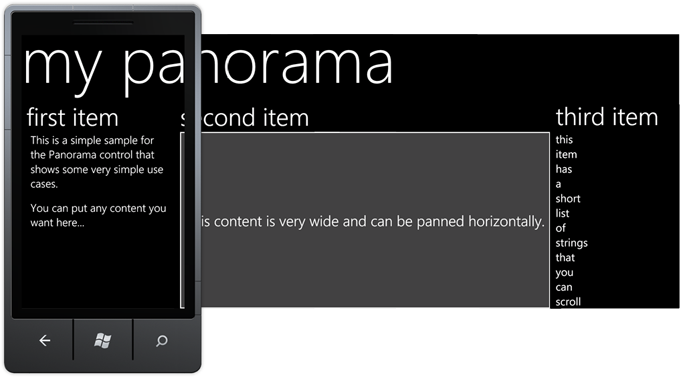 A panorama powers the people, music + videos, parts of Office, and more. Many of these have a large background and can be explored by panning and flicking between items. When you’re at one item, you will be able to see a little bit of the next item as well – a hint that there’s more to be explored. When you reach the far side of the panorama, you can keep going to wrap around to the beginning again, saving time. A pivot control powers the e-mail and calendar pages, operating systems, etc. The top of the pivot control shows the headers for all the different items, and you can swipe and pan between the pages. Just like panorama, the control wraps infinitely – so when you reach the final item, instead of having to flick all the way back to the first item, you can just flick once more.